What a special month June is for British ingredients: beautiful spears of asparagus, succulent strawberries, peppery pink radish, oil-rich mackerel and buttery Jersey Royals. 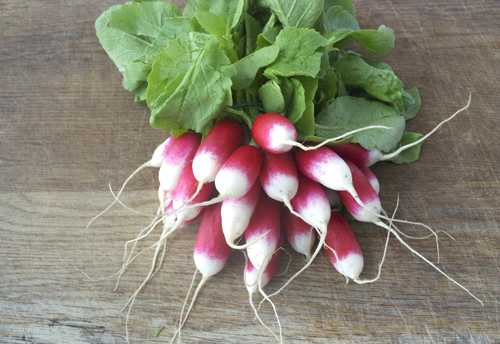 They need little endorsing other than a generous knob of butter but they are also delicious in a potato salad which is great as part of any summer spread or picnic. I like a potato salad with a creamy dressing but I don’t want it heavily laden with mayonnaise so I’ve used yogurt to keep it light. I wouldn’t advise using a low fat variety of yogurt as they can be quite tangy but Yeo Valley’s Mild & Creamy Natural yogurt works really well. If not any full fat natural yogurt will do. My thyme plant on my terrace had burst into clouds of little purple flowers and thought they would look beautiful as a garnish. They also gave little delightful explosions of fresh thyme but were not overpowering. Edible flowers are a bonus of growing your own but you could use lemon thyme leaves or extra chopped chives as an alternative. Put the potatoes in a large saucepan and cover with cold water. Add a good pinch of salt and bring to the boil. Simmer for 15 minutes until just tender. Drain and return to the pan and let them sit for a few minutes to allow the moisture to evaporate. Transfer the potatoes to a mixing bowl and leave to cool for about 5 minutes. Meanwhile, add the yogurt, honey, mayonnaise, mustard, chives, lemon juice and some ground black pepper to a serving bowl. Mix well then add the potatoes and radish. Stir gently to mix everything together and taste to check the seasoning is right. Add some more salt and pepper if required. Serve at room temperature garnished with the thyme flowers. 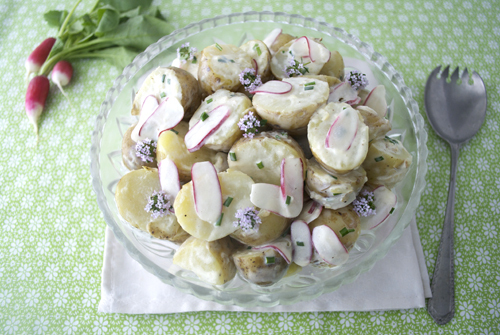 This entry was posted in Recently cooked and tagged healthy potato salad, jersey potato salad, potato and radish salad, potato salad, thyme flowers on 25/07/2012 by Val McArthur. What’s up, I log on to your blg oon a regular basis.